...of these bacteria, viruses, mold, and pollutants. The air also gets deodorized as well since almost all odors are an organic compound. There is also a secondary PURE-LIGHT effect on the surfaces of items near the light bulb, such as kitchen/bathroom counters, dishes, stoves, cutting boards, door knobs, etc. But what is this "PURE-LIGHT effect"? It was never defined. It got only worse from there. 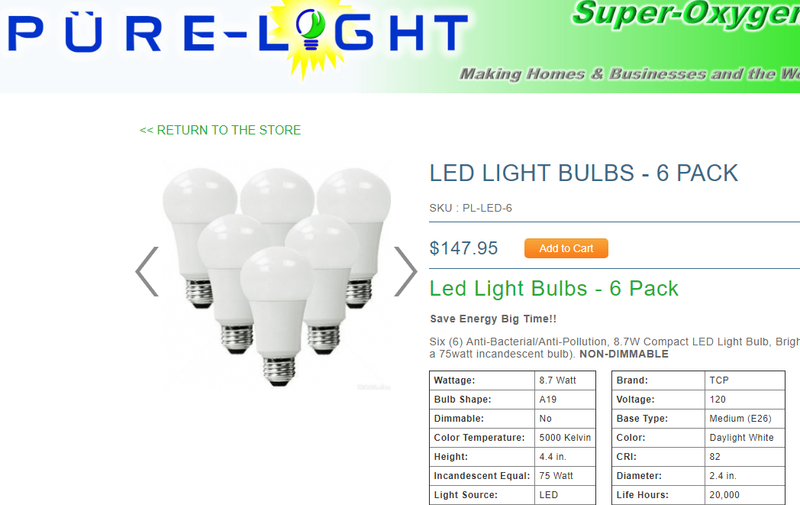 The two special super oxygen molecules Pure-Light bulbs produce are called SUPEROXIDE (O-2) and HYDROXYL ION (HO). 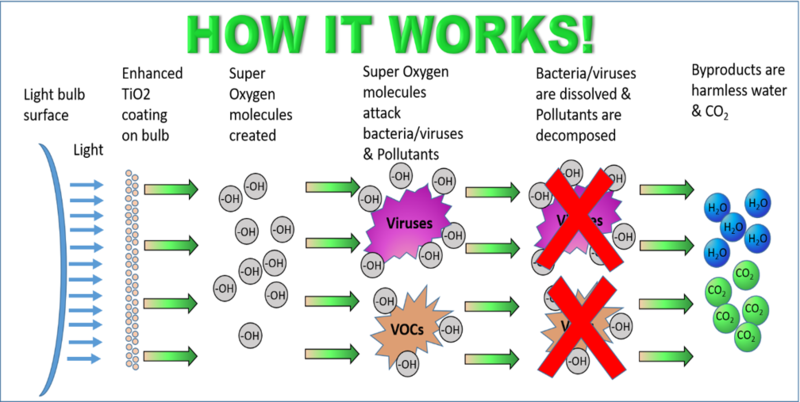 These two super oxygen molecules provide a triple "action"... two actions against viruses and bacteria, and another "action" against VOCs. There is no such thing as "super oxygen". The only place you'll find the term used frequently is at woo news sites such as "naturalnews" where the term is often used to refer to ozone (O3) as if it is better than oxygen. Indeed, Pure-Light claimed that white blood cell works... by feeding bad things extra oxygen... which is NONSENSE! 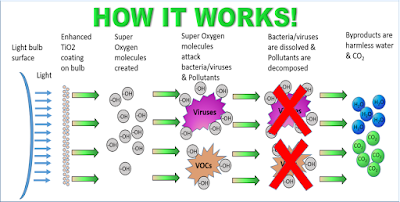 SUPEROXIDE (O-2), or SUPER OXYGEN, is actually produced in the human body in large quantities by White Blood cells and is used by the immune system to kill invading microorganisms. ​Superoxide (O-2) inside the body, or in the air, combines with a microorganism giving it essentially a boost of oxygen. Good cells thrive with the extra oxygen while viruses and bacteria are killed by the extra oxygen. Superoxides are also used in firefighters' oxygen tanks and divers rebreather systems in order to provide a readily available source of oxygen. White blood cells actually ingest the bad cells through a process called phagocytosis, and once the cells and virus are "eaten", they are digested with enzymes. Oxygen had nothing to do with it! We'll go over what REALLY happens after we explain their nonsense. And let's not mince words, Pure-Light explanation is pure nonsense since they can't even grasp basic principles like "how white blood cells work". But what's interesting is they made the appearance of being scientific by citing a whole bunch of scientific studies. But what do the studies really say? It turns out most of the so-called studies were not about the Pure-Light bulbs at all. And the one that did use the bulb? They didn't use a regular LED light, a CFL, an incandescent bulb, and so on to make comparison test. They simply used "no light" as a control case. Furthermore, the test setup was using SIX LIGHTS, at a distance of 5 ft and 8 ft respectively, and left for 24 to 72 hours. Please keep in mind that you *CAN* kill e. coli and other virus and bacteria with visible light. A paper published in 2008 on PubMed stated clearly that visible light need about 5-7 log mJ/cm(2) to achieve 100% mortality of the e coli cells. With SIX bulbs and up to 72 hours exposure of light, there's obviously going to be some reduction of any virus and bacteria. Without comparison to commonly available LED, CFL or Incandescent bulbs, there's no proof that Pure-Light Bulbs actually do anything beyond that of normal light bulbs. Their experiment proved their bulb is better than pure darkness in keep it reduced of bacteria and such, but who keeps their kitchen and such completely dark? The results are meaningless. Yes, there are papers about titanium dioxide nanoparticles and how they can clear the air... But that requires the bulbs to create a good portion of UV light or a lot of visible light, because TiO2 reacts to UV light and air (and moisture in the air, i.e. H2O) to produce Oxygen (O2) and hydroxyl radicals (OH). That part is true. Indeed, California was contemplating spraying roof tiles, walls, and glass with nano-particle TiO2 in areas with some wind so they can help combat air pollution. But that'd require a lot of buildings, and a lot of wind to move the air along. But we are NOT talking about outdoor paint. We're talking about an indoor LIGHTBULB. Indeed, how much air can move past a light bulb? And not even a regular light bulb, but an LED bulb which is, well, half plastic? Remember, this is THEIR photo... Just the top bit is glass. The bottom half is plastic shell leading to the plug. 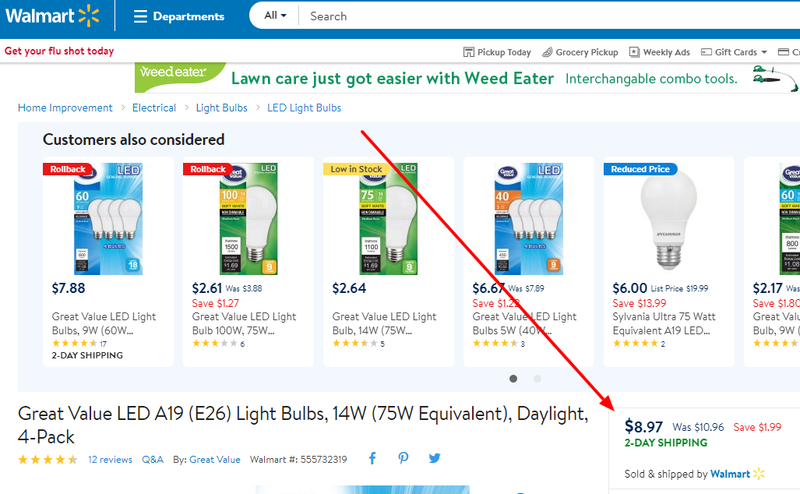 Dang, ($147.95 / 6) that's $25 per bulb. But there's what the bulb makers don't tell you... Almost EVERY BULB made contains titanium dioxide, ESPECIALLY LED bulbs. TiO2 is white, very CLEAN white, that it's often used for sunscreen, esp. the "white paint on nose" kind, or just outright included in paint as white pigment. Incandescent bulbs use it to coat the inside of the reflector for more consistently white light. It also turns out that Compact Fluorescent Lights, CFL bulbs that had spirals mini tubes, leak UV light, and those who wear sunscreen gets extra exposure somehow, according to this Stony Brooks research paper. And I did just mention that sunscreen contains titanium dioxide, right? As it turns out, some companies use this actually as a selling point. They put some extra titanium oxide on the outside of the tube to absorb the UV rays from within to trigger the photocatalysis, and sell the bulb as "odor eliminator" CFL bulbs. Experts are skeptical of such claims. How much air can one bulb clean? And remember, ozone is NOT GOOD for you. A) LED does NOT generate much UV light, unlike CFL bulbs. Regular glass (which is that bulb shape outside) will probably filter out UV light. But without UV light, titanium oxide can't do its job. Yet Titanium Oxide had to be on the OUTSIDE to clear the air, right? And again, how much ozone can this generate? Remember, experts already doubt CFL version of the same bulb do anything. LED, which generates even less UV, is unlikely to do ANYTHING. B) ALL LED bulbs contain titanium dioxide. Turns out, to get maximum light from the LED inside to the outside of the bulb, you need to "match the refractive index" from the delicate inside to the glass "encapsulate" outside while blocking the light. And one way to change the refractive index of the material is to introduce nano-particles, esp. titanium dioxide into the material. Previous work on index engineering of LED encapsulants has focused on the use of nano titanium dioxide (TiO2). C) Furthermore, similar to the regular incandescent lights, titanium oxide was used for reflector to make sure no light comes out the sides of the LED bulb. Reflection material dispensing is done around the LED chip to prevent light from coming out of the side wall of the LED. Titanium oxide (TiO2), which is a high viscosity material, is commonly used. But remember, they are on the INSIDE. Coating needs to be on the OUTSIDE to clean the air, right? So those bits of TiO2 doesn't do anything. But let's assume Pure-Light did put a coating of the TiO2 on the outside (indeed, you can buy TiO2 exterior treatments sprays for buildings.) So the question is, how much UV light does LED put out to trigger the photocatalysis? The answer is, minimal to none! So there really is no photocatalysis going on, unless Pure-Light changed the LED to emit UV light specifically, which they never claimed to. Indeed, they claimed specifically "No UV Light." But how do you get photocatalysis without UV light? You can't! And no photocatalysis means no Hydroxyls and "super oxygen", which Pure-light claimed does the actual work! In other words, Pure-Light's explanation of how things work does NOT even fit the science they cited! Bonus addendum: so how *does* the deodorizing bulbs actually work? Now you're probably asking... But they sold deodorizing bulbs for more than a decade. Do those not work? The answer to that is "no proof that they really work". TV station asked experts and they said one bulb is unlikely to do anything. It's unlikely one lightbulb can do much. But *can* it work, even on a tiny scale? The answer to that is yes, photocatalysis is real. The mechanism is *similar* to what Pure-Light described, but they got the explanations all wrong. Photocatalysis basically has the titanium dioxide (TiO2) absorbing UV rays (either from the sun or from UV source) and react with O2 and H2O in the air. It creates O2- ions or "oxygen ions", with one electron added from all the UV energy absorbed, which allows O2- ion to attach itself to something. It also creates the hydroxyl radicals (-OH) that react with other stuff in the air. Indeed, you can easily buy ionic air purifiers. But they usually have fans that move air. Those ionic air purifiers that don't have a VERY limited range, a few feet at best. Nothing moves air past a light bulb, so its range is at best, a few feet. EPA's guide to residential air cleaners has a section on "Photocatalytic Oxidation Cleaners" (pg 20) but none of them talked about lightbulbs, but rather, they are basically ionic air cleaners with UV ray inside, shining on TiO2 plates, to react with some pollutants in the air. Test results say the devices are not effective. A lightbulb cannot work any better. 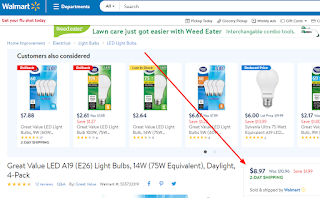 Which basically makes the Pure-Light bulbs something that costs10 X what a regular LED bulb should cost, for no proven benefits.